Roxy Pro France ran Round 2 and Round 3 at Landes in Nouvelle-Aquitaine on October 9th and 11th. Keely Andrew (AUS) withdrew from this event due to injury. She was injured during in Heat 6 of Round 1, but she was surfing through some pain, her injury was more serious than recognized at the time. In Round 3, current ranking No. 1 and No. 2, Stephanie Gilmore (AUS) and Lakey Peterson (USA) were defeated, respectively. This result marks the World Title will be decided during the final Championship Tour event on Maui. Defending Champion of this event, Carissa Moore (HAW) earned 8.27 and 7.77 points with a total of 16.04 points, which was the high score of the day, advanced to Quarterfinal. Stephanie Gilmore said, "It's the worst feeling, ever. You are trying so hard and there's so much pressure. Look I'm emotional, but that just shows how much I care about it. It stings and it hurts, but now it's all about Maui." Lakey Peterson said, "I felt like the chips were falling into place, but honestly I am just disappointed with my surfing. I let a couple of things get in my head too much and that affected the control of the heat." She continued, "On the positive side I'm still in the race and the race is going to Hawaii, so I still have a chance. I'll go home, get a breather. I'll rest up, get healthy. I'll keep training and keep surfing and be as good as I can possibly be at Maui." 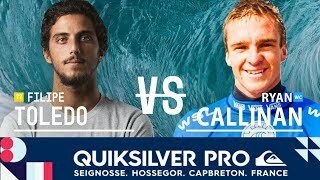 While, Quiksilver Pro France ran Round 3 on October 11th, injury replacement Ryan Callinan (AUS) beat current Jeep Leader Filipe Toledo (BRA) in Heat 6. The Heat was close game, Ryan Callinan's Heat total of 16.80 was the best of the day. Remarkably, Filipe Toledo's tally of 16.60 was the next best. Ryan Callinan said, "I feel that was one of the best heats of my life for both performance and pressure. Filipe is a big name and obviously on a tear this year as he is leading the ratings. So to be able to get the scores and, more importantly, big scores feels amazing."